We take pride in our knowledge and professionalism, and our ability to provide outstanding service. 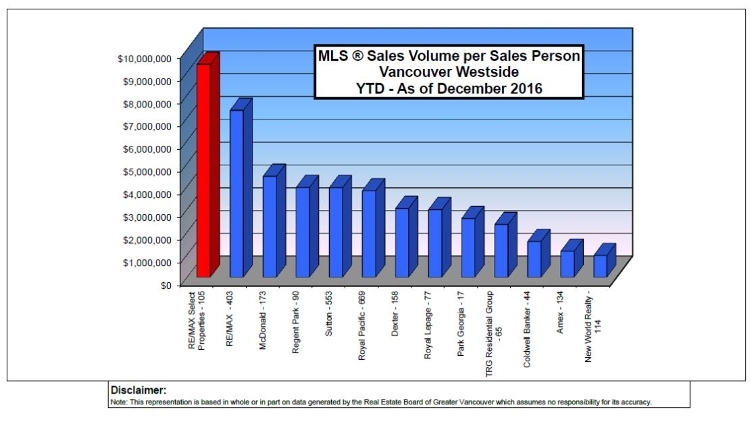 Situated in the middle of Vancouver's prime Westside residential district, the "Select Team" serves such well-established communities as Shaughnessy, Kerrisdale, Point Grey, Kistilano, the UBC Endowment Lands, False Creek, Dunbar, Fairview, Oakridge, Arbutus and Downtown. Many Ethnic groups and languages are represented within the Select Team. The combination of award-winning agents and management make for a dynamic company, ready to serve you to the highest level in meeting your real estate needs on the Vancouver Westside. After first opening the Brokerage in 1990 in the Arbutus Shopping Centre, RE/MAX Select Properties recently relocated into a new 6,000 sq ft facility. In the spring of 2012, RE/MAX Select Properties opened its doors for business in the exciting West Boulevard area of Kerrisdale, a ten minute drive from the University of British Columbia and downtown Vancouver. Situated in the middle of Vancouver's Westside prime residential trading area, RE/MAX Select Properties is easily accessed with a high visibility ground floor location, and a bright, inviting, modern, high tech office to serve you. As a leading Real Estate Agency in Vancouver, British Columbia, we have properties that cover a wide range of interests, including water views, city views, waterfront, majestic heritage homes, large gated estates, equestrian property, family areas close to prime private and public schools and community centres, as well as a choice selection of condominiums in varying locations. Well-established communities such as Shaughnessy, Kerrisdale, Point Grey, U.B.C. Endowment Lands, MacKenzie Heights, Dunbar, Arbutus, Marine Drive, South Granville, Kitsilano, False Creek and others offer something for everyone. Amenities include quaint coffee houses or fine dining, five golf courses and easy access to a boater's paradise. The local ski hills are only 30 minutes away. Call one of our associates today for more information on this incredible area we have the priviledge of servicing.